I’ve been exploring using Scribus, a free desktop publishing alternative to Adobe’s InDesign. 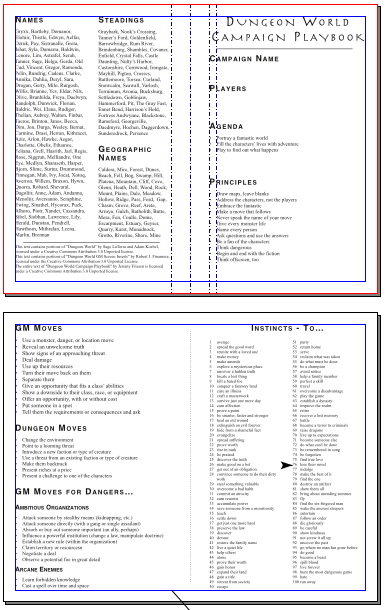 Previous Take On Rules PDFs have been crafted using iBooks Author, but I wanted to try something different. So I began work on a Dungeon World Campaign Playbook – a printable, ready to saddle stitch booklet. To create your own, make sure you can do 2-sided printing. For my cover page, I grabbed some super heavy paper stock. Another thing that I considered is that the inner pages of a saddle stitched book can easily be removed without adversely affecting the book. In the current iteration, I have Fronts occupying this position, but you could just as easily add blank sheets of paper in the middle. Go ahead and download Dungeon World Campaign Playbook. Dungeon World Campaign Playbook by Jeremy Friesen is licensed under a Creative Commons Attribution-NonCommercial-NoDerivatives 4.0 International License. Based on a work at https://takeonrules.com/2013/05/08/dungeon-world-campaign-playbook/. Permissions beyond the scope of this license may be available at https://takeonrules.com/more_permissions/.